If your joint is larger or smaller, work out timing by reckoning on an hour per kilo, remembering that it's going to get a quick blast in the oven later. 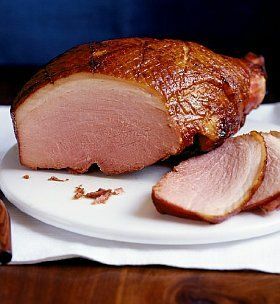 But do take into account that if the gammon's been in the fridge right up to the moment you cook it, you will �... 11/05/2013�� I had a bit of a splurge at a recent farmers market and bought a freezer full of meat joints - the gammon is lovely but very, very salty. Is there a way of drawing salt out prior to cooking - it's only cheap stuff but the saltiness is pretty powerful. If choosing this option, make sure the joint has a good amount of fat, as this will help to keep the gammon moist as it cooks. Dominic Chapman uses a traditional method to bake his gammon . By coating the meat in a bran paste before cooking long and slow, the meat is permeated with a pleasant nuttiness and is kept moist by the protective bran coating. anki how to make hard cards come after one day The joint was quite small, just less than half the size of the tin so the picture wasnt an accurate representation of size. Also, the maple sauce was very watery. That said, I only wanted this for two people and we both enjoyed it. Wouldnt buy if full price. 28/08/2009�� I like it with a parsley sauce - white bechemal sauce with parsley added. To make bechemal if you're not sure, it's (I never really measure the quantities, I'm afraid) melt a couple tablespoon of butter, add a tablespoon of flour and stir till mixed, then add milk, around 1/2 pint, mixing it in slowly to get rid of lumps, then simmer to thicken how to open a joint account I was looking for gammon tips and came across this post, the lady suggests you can, I've not tried it though: I cook a large gammon joint every Xmas and always use the same method, and it comes out succulent and beautiful every time. 10/03/2014�� I served my gammon joint with fan-tailed roast potatoes and roast carrots cooked in the gammon fat, buttered peas and home-made gravy! Since most of you can roast vegetables, I�ll just let you know how to cook the joint and make the gravy!